A little under two years ago I was diagnosed at 12 years old with a brain tumor, Medulloblastoma. It was shocking to me because just a few months before I was competing in soccer on a USA youth team playing against the Bayern Munich youth soccer team in Germany. I worked hard for two years to make the team and was definitely at my best physically and then, suddenly, one month later I was waking up vomiting. The symptoms went away after three days, but ten weeks later, they came back with vomiting and double vision. The MRI showed a golf ball sized tumor in the back of my brain against my brain stem. I was shocked, but I never felt alone. My faith got me through it. Every three months I have an MRI and they all have shown no evidence of disease. I am recovering slowly. It’s hard to gain weight because I’m growing. If I don’t gain weight, then I won’t have the strength to go back to the activities I enjoy like soccer, school and just being with friends. I keep trying, one bite, one sip, one day at a time to get to my goal. I don’t want to take the medicine, I want to try to be able to do it on my own. Yesterday, I learned that another friend of mine went to heaven. It doesn’t seem fair. I know that he is in a better place. 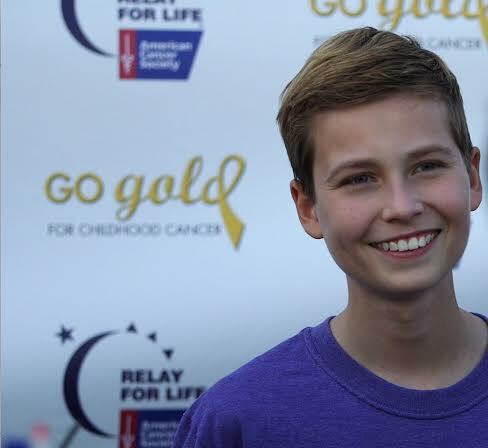 Cancer brought Cole Owens and I together and cancer has separated us, but I will see him again. I know that I was meant to speak on behalf of others. When I would walk by the rooms on the cancer floor I would see children too small or too sick to speak out. I’ve had experience speaking, so it just made sense to me that this was what I was meant to do. The first thing I did while I was in the hospital was that I noticed there was a room that was not used very often. It was a consultation room that mostly parents used. I thought that it would be a great idea to make a “teen lounge” so when friends or family members came to visit they could go in that room and spend some time together out of the hospital room. It also would be a way for teens on the cancer floor to support each other. 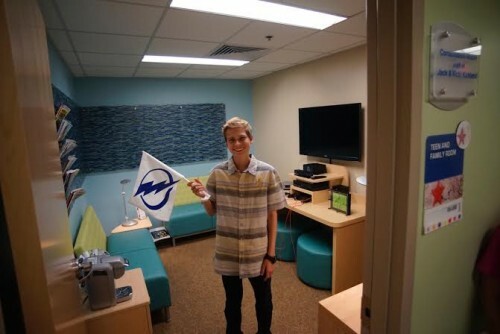 Cole at the opening of the Teen Lounge at his treatment hospital that he inspired and fundraised for. In my entire year of treatment I met only one friend at the very end of treatment. His name was Corey Parker and we used to pass the time with RC cars racing down the hallways. The nurses didn’t mind the noise because they new it was good for us to be together. Corey’s cancer came back and he was fighting it for the second time. He fought it bravely, but never got to enjoy the teen lounge with me. I think of him every time I go back and visit. Now that I’m feeling better I am working on a couple of projects to spread awareness. I was lucky enough to be supported by my local professional soccer team during my treatment. Some of their season ticket holders told them about me and the team gave me a one day contract that turned into much more. On game days the players would come and catch up on how I was doing and it gave me something to look forward to. I felt special because they said I motivated them to work harder through their challenges. 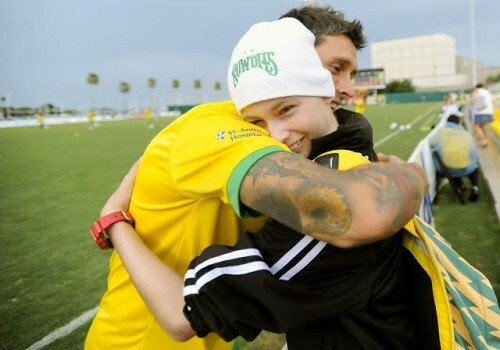 Cole being embraced by a Tampa Bay Rowdie player. What a win-win. This year when the season started I asked for an appointment with the owner of the team. I told him how the support of the team really helped me and I wanted to help more kids. I asked him to have the team “Go Gold” for childhood cancer awareness month in September. He said yes! When I asked him if he would help me inspire the entire North American Soccer League to “Go Gold” next year, he said yes. I can’t wait to see all the kids at the games with their families having fun and feeling supported. We are also fundraising for pediatric cancer organizations during the month. I’ve seen that sharing my story makes a difference so I shared it with the American Cancer Society. They have $18 million dollars going toward pediatric cancer research each year and have 35 researchers working on current projects, but I’ve learned that many families don’t know that they can have resources and support from them. I’ve also learned that kids like me can often get cancer again. If that happens, we will need to rely on the American Cancer Society as I will have outgrown the pediatric cancer support groups. They do a good job, but they can do more. I have seen that when kids share their story that people want to help. I made a video in partnership with the American Cancer Society that I hope will make more people aware of childhood cancer and I also want it to give people hope. In the video I share that I got through cancer treatments by taking it one day at a time and at the end when you feel like giving up, that you just have to give it a little more and you’ll get through it. This video will be seen by everyone who works for the American Cancer Society and will be available for all the thousands of volunteers to see also. My Mom says “when you meet a child with cancer you never ever forget them.” I am hoping that this will be the case so that we can focus on curing cancer.